Rotisserie chicken from our deli is an easy way to get great roast chicken without the work. In 9x13-inch baking pan, combine first 5 ingredients. Toss with olive oil, salt and pepper. Bake in a preheated 425 F oven until tender (25-30 minutes), stirring occasionally. In large bowl, toss roasted vegetables with peas, chicken, gravy and 2-3 teaspoons thyme. Spoon 1 3/4 cups filling into each of 4 (16 ounce) bowls. Make sure mixture is below the rim of each ramekin. Remove pastry sheets from package and lay flat on floured surface. Sprinkle each sheet with 1 teaspoon each of parsley, thyme and rosemary. Roll sheets of pastry to 1/8 inch thickness. Cut 2 circles from each sheet, 1-2 inches larger than top of bowls. Arrange each pastry circle over prepared bowls, tucking pastry under edge of bowl; crimp. Beat egg with water; brush over top of pastry. Place pot pies on baking sheet. Bake in a preheated 400 F oven until golden brown (25-30 minutes). Let stand 5-10 minutes before serving. 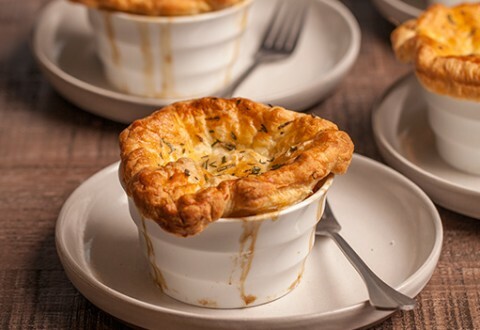 Tips: Pot pies may be made ahead and frozen. Assemble through the crimping step, double wrap in plastic wrap and freeze up to one month. When ready to use, remove from freezer; brush with egg wash and bake, frozen, at 400 F until golden brown and bubbly (35-40 minutes).